The car came slowly down the road dodging the mud puddles left by the recent rain. I thought I recognized the car as it pulled into the parking lot next to the fisherman's hut, and I watched as a young man got out of the vehicle. Slight of build with a black mustache, and black hair showing below the brim of his hat, he walked briskly over to the edge of the stream. I thought it strange he did not acknowledge me as I sat in the shade beside the hut, but perhaps he thought I was resting. He stood on the bank for a moment and then turned back to his vehicle. Quickly he assembled his rod, donned his waders, slipped on his vest, and without a glance in my direction turned upstream. Intrigued by this young man who seemed so familiar yet somehow a stranger, I followed at a distance as he made his way along the bank. He walked slowly for several hundred yards before he stopped at the tail of a riffle and sat down on the bank. Not wishing to disturb him, I stopped several yards away partially hidden by the streamside vegetation. As I watched, he took a small net out of his vest, and for the next several minutes he reached out and scooped up insects from the surface. "Interesting," I thought. "It's not often I see another angler use a net like that to check the hatch before he starts fishing. Where have I seen this young man before?" After several minutes of watching the water and checking the contents of his net he took a fly box out of his vest, and after a few moments of contemplation selected a fly and tied it on his tippet. After dressing the fly he continued to sit on the bank for several more minutes watching several trout that I could see rising just upstream. Like a great blue heron wading slowly along the shallows looking for prey, he slowly eased out into the stream, keeping his profile low to avoid spooking the feeding trout. His reel made a smooth clicking sound as he stripped off line and began to false cast. Carefully he lengthened his cast taking care to not to cast his line over the feeding fish. His first cast was off to the side calculated, not doubt, to gauge the distance of the closest riser without disturbing the feeding fish. "Wise move," I thought. In the shallow water at the tail of the riffle these fish would be very spooky, and a careless cast could cause all of them to flee into deeper water. Satisfied that he had measured the distance correctly his next cast straightened behind him and almost in slow motion it snaked forward and dropped like thistle down just above the closest rising trout. The drifting fly disappeared in a dimple, and as he raised his rod the water boiled and his rod bowed under the pull exerted by a good trout. Dropping his rod toward the water he maneuvered the fish away from the other risers and finished the battle downstream from the other fish. After several spirited runs the trout came to net, a fine golden brown whose length exceeded the size of the net so that part hung out over the rim. Moments later it disappeared with a flick of his tail, and the angler turned his attention to the other trout that were still rising undisturbed in the shallows of the riffle. 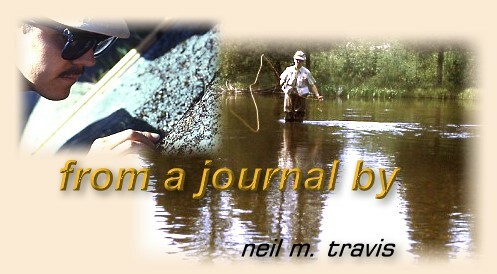 I stood quietly watching the young angler as he took each of the trout in turn. When he had finished catching the last of the risers he turned back toward me. His face was no longer young, and his mustache and hair were no longer black but gray. He looked right at me, and I saw a slight smile flicker across his lips.